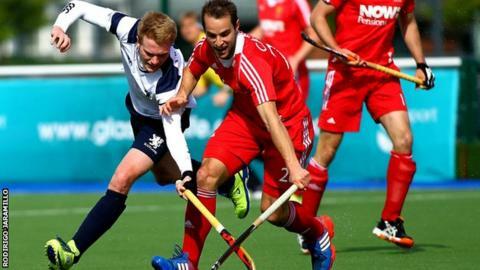 England's men proved too strong for Scotland with a 3-1 win at hockey's Four Nations tournament in Glasgow. Second-half goals from Tom Carson and Simon Mantell gave the visitors victory and kept alive their hopes of winning the Commonwealth Games warm-up event. Barry Middleton had given England the lead in the first half and Ashley Jackson's penalty stroke hit the crossbar before Chris Nelson levelled. England face Belgium and Scotland play Argentina in Monday's final pool games. Belgium top the standings after a 2-1 win over Argentina on Saturday. against Belgium on Friday, while England were held to a draw by Argentina. "It was a far more positive performance today," said England head coach Bobby Crutchley. "We dominated possession for long periods but couldn't break down a resilient Scottish defence until the last quarter of the game. "There are still areas we need to improve. We look forward to the challenge that Belgium will present on Monday." Scotland head coach Derek Forsyth said: "Defensively at times we were excellent, but when we're playing teams at this level we need to keep the ball longer so we can control the game a bit more. "Every time we defended well, we made life hard for ourselves by turning the ball over too quickly. "That said, England are a good team about to head to the World Cup. [It was] another great experience for the players and we move onto Monday against Argentina."